Students experiment with acidity of solutions and then use electricity to split water into hydrogen and oxygen and observe changes in the solution. How can water be split into its simple elements? Normal tap water (H2O) is electrolyzed using a common 9-volt battery Epsom salt. The H2 and O2 gases that are produced are isolated and collected safety in separate containers. A natural anthocyanin pH indicator extracted from red cabbage is used to show vividly color changes at the positive and negative terminals of the battery during the water splitting process. The positive terminal becomes acidic and the terminals are often incorrectly labeled since hydrogen is thought to be acidic. The products of water splitting is hydrogen gas (H2) and oxygen gas (O2), which are both neutral species. Hydrogen ions (H+), which are acidic, are a byproduct produced in the oxidation process. Researchers are developing new catalysts for water splitting. Some can split water directly when exposed to sunlight– photocatalysis. Red cabbage indicator – add 4-5 scoops of the powdered cabbage juice each liter of water used. For a classroom with 12 pairs, 2-3 liters should suffice. Vinegar (an acid) and ammonia (a base) can irritate the skin and eyes. Avoid direct contact with skin and eyes. In the event of direct contact flush with water for 15 minutes. Natural anthocyanin dyes can stain clothing and skin. Avoid spilling anthocyanin dyes on clothing and skin. H2 and O2 gases are flammable, avoid being in close proximity to sparks and fire. With the help of your partner to stabilize the pipettes so that they don’t disconnect from the electrodes, place your electrolysis cell on top of your 9-volt battery so that each battery terminal is connected to only one of the thumbtacks that is inserted into the bottom of your cell . Dispose of your solutions down the drain. 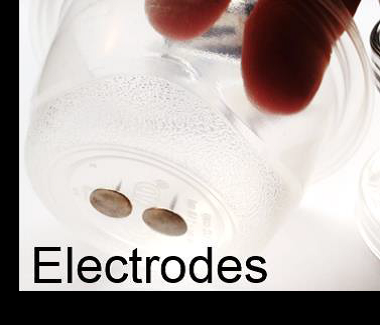 Bonus: Write the half reactions occurring at the electrodes (one at each electrode). To get full reaction from the half reactions, the electrons must cancel. Thus, multiple the reduction half reaction by two and add the resulting equation to the oxidation half reaction. Fig. 1. We have extracted a natural anthocyanin dye from red cabbage. We use this dye as a universal pH indicator. The color change from purple to green or red allows us to show that splitting water into 2 parts H2 (larger volume of gas) and 1 part O2 (smaller volume) using a common 9-volt battery and two thumbtacks also generates acid (red) at the anode and base (green) at the cathode. Try burning the hydrogen by bringing a match to the hydrogen tube. Blow out the match and while its still glowing place it in the oxygen filled tube. Demonstrate electrolysis / fuel cell with the fuel cell car listed below. Normal tap water (H2O) is electrolyzed using a common 9-volt battery and Epsom salt. The H2 and O2 gases that are produced are isolated and collected in separate containers. Anthocyanin dye used as a pH indicator was extracted from red cabbage is used to show vivid color changes at the positive and negative terminals of the battery during the water splitting process. This activity can also be done with a solar panel instead of a battery! Do you observe any bubbles or color changes? Without removing the tips of the pipettes from the solution, place each pipette tip back over one of the electrodes in your electrolysis cell again. What happened at the positive battery terminal? What happened at the negative battery terminal? How much solution was left in each of your pipettes when your experiment was finished? What does this mean about the volume of gas that was produced at each terminal? From Question #3, explain how we know that water has the molecular formula H2O? Do you think that the solution at the positive terminal was acidic, basic, or neutral? Do you think that the solution at the negative terminal was acidic, basic, or neutral?